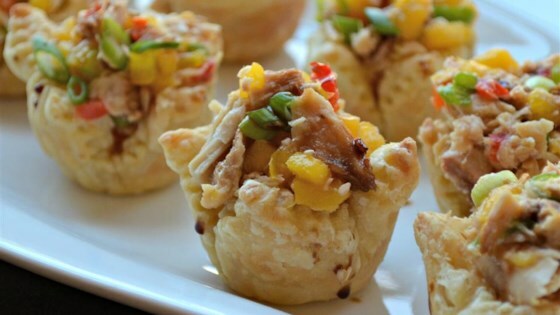 "Mini puff pastry shells filled with Bumble Bee® Solid White Albacore Tuna in Water, sweet bell pepper and juicy mango, topped off with a drizzle of sweet and spicy Asian sauce. A perfect little appetizer for your next get-together!" Combine gyoza dipping sauce, sugar, garlic, toasted sesame oil and red pepper flakes in a small sauce pan. Cook over medium heat until reduced by half. Remove from heat and set aside. Place defrosted puff pastry sheet on a lightly floured work surface. Dust the top of the puff pastry sheet with flour, and roll out slightly to form an 11 x 13-inch rectangle. Cut the pastry sheet into 24 equal size rectangles by cutting the 11-inch dimension into 4 equal strips, and then cutting the 13-inch dimension into 6 equal strips. Bake for 8 minutes. Remove from oven and punch down the puffed up middle portion of the pastry cups with a fork. Return to the oven and bake an additional 3 minutes, or until lightly golden brown. Remove from the oven and punch down the centers again with a fork, forming a nice hole for the filling. Let cool completely before removing from the muffin tin. In a medium bowl, lightly toss the tuna, mango, and sweet bell pepper until evenly combined. Using a small spoon, fill each puff pastry cup with the tuna filling. Drizzle the reserved sauce over the tuna filling and garnish with the chopped green onions and toasted sesame seeds. A round, 1-1/2 teaspoon measuring spoon, well packed with the filling works really well to fill the pastry cups.